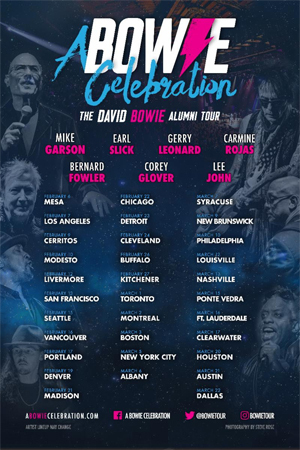 A BOWIE CELEBRATION features alumni band members Mike Garson, Earl Slick, Gerry Leonard and Carmine Rojas along with world-class vocalists such as Bernard Fowler and Corey Glover, among others, and drummer Lee John performing a mix of Bowie's hits and deep-cuts. Pre-sale tickets for the newly announced shows are available Tuesday, September 11 through Thursday, September 13 with the general on-sale commencing this Friday, September 14 at 10am local time. Kicking off February 6 in Mesa, AZ, A BOWIE CELEBRATION then stops in Los Angeles February 7 at the Orpheum Theatre before making its way across the country and into Canada. The critically acclaimed show will stop in San Francisco, Seattle, Vancouver, Denver, Chicago, Detroit, Cleveland, Toronto, Montreal, Boston, New York City (March 5 at Irving Plaza), Philadelphia, Louisville, Nashville, Fort Lauderdale, Houston, and Austin, among many other cities, before wrapping March 22 in Dallas. See below for full list of North American tour dates and venues and visit www.abowiecelebration.com for ticket information. Watch the show's trailer below.